Register for the R-23 Energy Envelope System Upgrade! Home|Blog|Uncategorized|Register for the R-23 Energy Envelope System Upgrade! Katahdin’s Energy Envelope System™ meets or exceeds the sweeping new federal energy requirements based on 2009 International Energy Conservation Code. Better efficiency saves you money. Katahdin Cedar Log Homes has been a proponent of energy efficiency since we first offered our insulation package in the 80s. Now, with energy efficiency building codes set to increase savings dramatically, Katahdin is ready with the Energy Envelope System™. 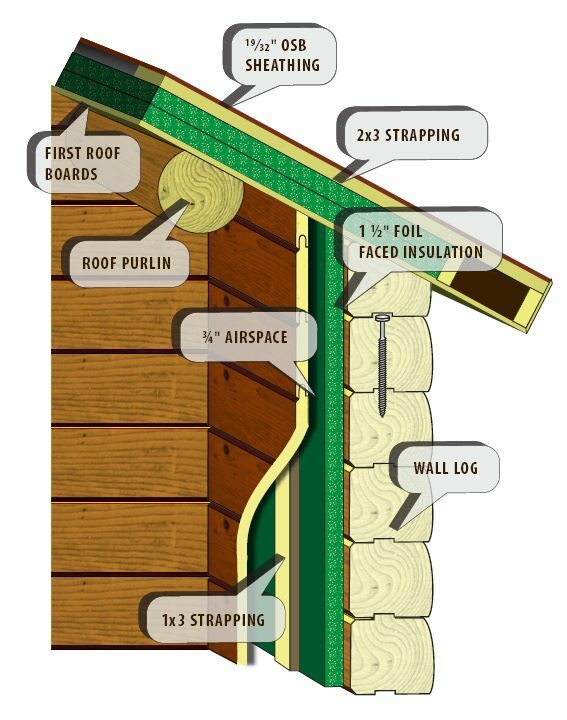 This unique insulation system takes advantage of natural characteristics of Northern white cedar and our state-of-the-art milling and manufacturing facility to provide your home with the required energy efficiency without sacrificing the beauty of whole-log construction. Many years ago, Katahdin developed an added insulation package in part to utilize the many board feet of cedar that wasn’t wall stock grade. They developed a system to add insulation to the interior of log walls, then finished the interior wall with cedar tongue-in-groove paneling that mirrored the shaped finish of a log wall. As energy concerns increased, our design team worked to bring the insulation system up to more stringent customer demands. The result is the Energy Envelope System™ that Katahdin launched in 2008 (at right). With this high-efficiency insulation system in place, Katahdin was fully prepared to meet the tougher 2009 IECC energy codes to be implemented in 2010. *Please note: This Energy Envelope System™ Promotion may not be combined with any other corporate offer. Current customers are not eligible. Katahdin reserves the right to terminate this promotion without notice at any time.